I finally finished my first lace yarn using my boy?s fluff! I made a very fine ply of angora (blue in color to be exact) and a find ply of white silk, and combined them together to get a light lace weight yarn. It isn't gossamer by any means, but it's still pretty, and light by most standards. I spun the Angora Single on my Golding Walnut (heavier spindle, though I can't remember the weight off hand) and the Silk on my new Golding Porcelain Dragonfly spindle. Both parts were so enjoyable to spin, and even the plying was straightforward. I started with around a half ounce of Blue English Angora - which had been hand carded with just a tiny wisp of Carbonized Bamboo and an equally tiny wisp of creamy merino. 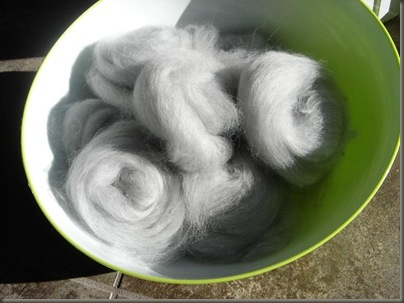 I just wanted a few longer fibers mixed with the angora combings, hoping it would make a more stable yarn in the end. I used very little of either addition... and in the end, you really can't see the bamboo or wool. Maybe it wasn't worth the trouble to add it in? The angora used here was the combings from Ruttiger's daily grooming. I'm greedy with my fiber I guess... I've been saving every last wisp that isn't tangled or dirty... so in addition to the lovely prime fiber (which I am saving until I actually KNOW what I'm doing lol) I have quite a lot of "seconds" quality fiber. I didn't want to use up the prime fiber right away, so I decided to try carding up some of this just to see what it would be like. The results are heavenly! I did have to pick out some neps and tangles, but overall, the little combfulls of fiber opened up beautifully and were very enjoyable to spin. The silk was just plain ordinary silk... that I bought 4 ounces of from Belfast Mini Mills earlier this summer just for this purpose... and was the most fun I've had with silk to date. I've finally gotten comfortable with "spinning from the fold" - and silk is definitely a good choice for a fiber to be spun this way. The resulting thread is smooth and shiny. Everything Silk is meant to be! And my new Golding Dragonfly is the perfect weight for these light singles. I can see I will be using her quite often from now on! I think her name will be the "Dragonflier"... which is actually a name I used to go by on a forum back in the dark ages of college!The color reminds me a bit of sterling silver? with a bit of soft dove grey and the shine of the silk. 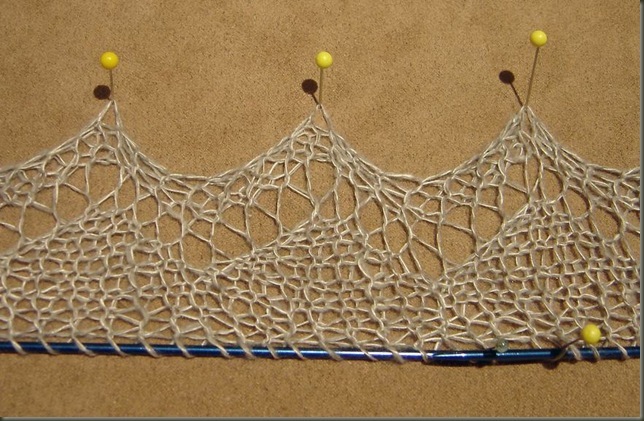 So far, just in handling the knitted piece a bit, there is a light halo beginning to form? can?t wait to see how it goes! 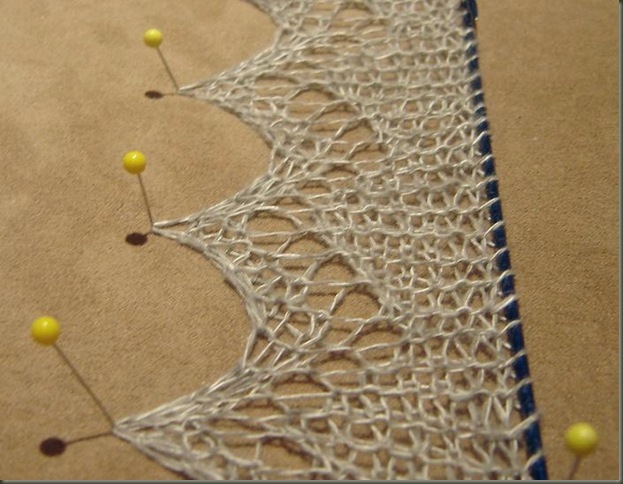 I have been using the Gossamer Webs Design Book as a supplement to this pattern to make sure I have been doing the stitches properly. 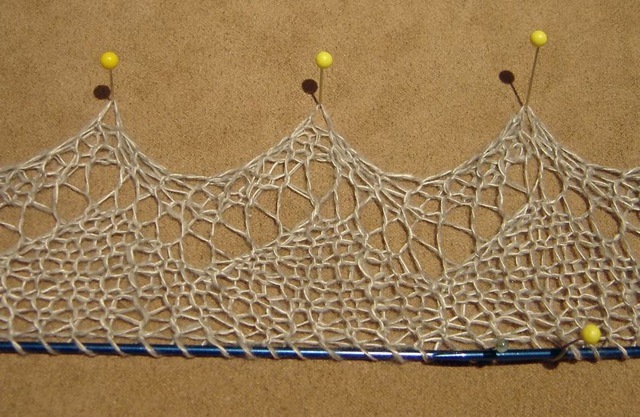 The strawberry pattern itself is more of a schematic, and not really a complete pattern intended for a beginner knitter. I have several reference books at home that I have been referring to, and they help a great deal. So far, I'll I've accomplished is 6/10 "teeth" for the bottom edge of the stole, but I hope to spend a few minutes each day until I have the stitches picked up for the main body of the stole, and then a few rows each day as a treat to myself as I slog away at the Holiday Knitting. The teensy yarn takes some getting used to... and dropping stitches in a case like this is a disastrous event. I have a feeling I will need lifelines for this project. I went up a few sizes in needles already from what the pattern recommended, because I am a tight knitter, and because I wanted this fabric to be light and airy in the end. 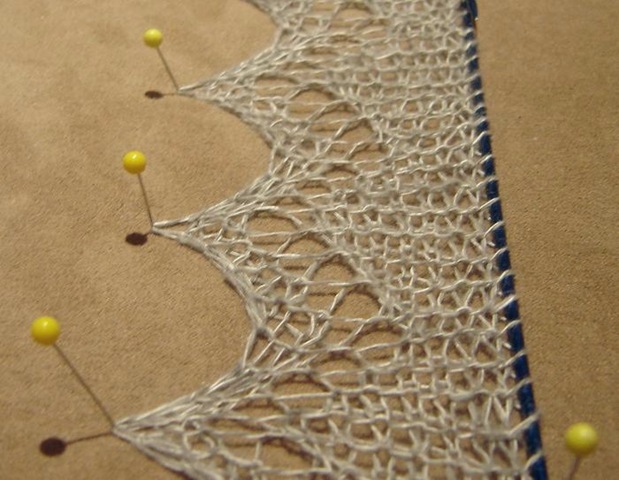 On the 2mm needles, there wasn?t much space between the stitches. Maybe someday when I have been able to spin actual gossamer yarns I will be able to try a more authentic needle size for this type of pattern. Now I just need to finish my remaining holiday knitting so I can sit down and do some more of this! I need to spin likely 3 more cops of each silk and angora... and then find time to sit and knit of course! Silver Strawberries: Finished!Finally... after many months of work... My "Silver Strawberries" stole is complete! The fin...WIP Wednesday: Silver Strawberries Orenburg-Style StoleI've been chugging along on my Silver Strawberries Stole... making some progress! I've finally com...Silver Strawberries... the Actual Strawberry Part!Making progress on my Orenburg-Style Stole... in Angora and Silk light Laceweight!